“The Pharisees went and consulted among themselves, how to ensnare Jesus in His speech. The Pharisees, and the Herodians. It is useful to understand who these two very different groups were. In Israel, around the time of our Lord, there were a number of different factions who played a role in the day to day affairs of the people. In modern terms, we would probably think of them as political parties—all belonging to the same nation, but with different ideas about how things should be done. The Sadducees and the Essenes were two of the parties, corresponding roughly to the priestly class, and to those who were practitioners of Jewish monasticism, respectively. They were not mentioned in today’s Gospel, so perhaps we can talk about them some other time. The Pharisees, who are mentioned, are familiar enough to us for they appear in a goodly number of Gospel accounts. They were the descendents of the Machabees, the families who rose up against the invaders who came to Israel after the breakup of the kingdom of Alexander the Great. The were zealous for keeping the Law of Moses, even though it had been forbidden by their pagan conquerors. You have been reading about them if you have been following the Scripture outline we publish in the Parish Bulletin. The Pharisees were often at odds with our Lord, because, by His time, they had degenerated into a group concerned only with keeping the outward appearances of the Law. Indeed, they wanted to be seen keeping the appearances of the Law—they were hypocrites. The other party, the Herodians, were not necessarily religious (although they might have been)—they were the followers of King Herod Antipas. This was not the tyrant Herod the Great, who murdered the Holy Innocents, but rather his son—nasty enough in his own right (he is the one who murdered John the Baptist, and participated in the mock-trial of our Lord), but he was nothing like his father. Most of the Jews resented the Herodians because they were foreigners from Idumæa, in the southern desert, who were only forced converts to Judaism—and more so because the Herod family ruled as puppets of the Roman Emperors. It was, then, an odd alliance—two very different groups of people who converged on Jesus to ask him this question about paying tribute to the Romans. There were religious zealots, as well as men fiercely loyal to Cæsar’s puppet government. Both were groups of men who thought in terms of black or white—one could either be loyal to the Law of Moses, or loyal to the Romans—and, from both points of view, anything else was an intolerable compromise. The Pharisees brought the Herodians along knowing that if Jesus forbade the paying of tribute to Cæsar, they would very likely take Him into custody right then and there, and the Roman authorities would solve the problem that the Pharisees thought they had with Jesus. On the other hand, if in fear of the Herodians, Jesus did approve paying tribute to this hated foreign power, the Pharisees would be able to smear His reputation among all of the Jews who held to the Law of Moses. What neither group did foresee was that God and government are not necessarily antagonistic to one another. One could go to the Temple and worship God there, and give tithes to support Its personnel and Its good works—and one could also respect the ruling government, supporting its personnel and good works as well. Now, it is clear that the people of the Temple and the people of the government were antagonistic toward one another. The Jews viewed the Romans as yet another group in a long line of foreign conquerors. The Romans viewed the Jews as a “stiff-necked people” with vision too limited to take in the advantages of Roman society. But our Lord was a realist. Of all the conquerors in Jewish history, the Romans were unique in respecting the Temple and its many religious laws. The sacrifices and the festivals, and the new-moons went on pretty much as they had at the time of David and Solomon. No one was forced to violate the kosher food laws, or to offer sacrifices to false gods, as happened during the time of the Machabees. No one was taken anywhere into captivity, as in the times of the Assyrians or the Babylonians. The Romans even respected the Jewish prohibition of engraved human and animal images, and minted coins without them especially for use in Palestine. Rome of the first century also represented a new force for stability throughout the known world. Yes, you had to pay your taxes, but they were far lower than anything modern Americans face on April 15th. And the Romans probably did walk with a bit of swagger in their step, but we get that from actors and politicians all the time. The important thing was that Roman stability meant peaceful and profitable trade all around the Mediterranean. It meant that your crops didn’t get burned by marauders, and that the money lenders didn’t charge excessive rates, and the merchants were more likely sell a just weight. You could get justice through the Roman authorities. And, if you weren’t a trouble maker, you could sleep more soundly than people had for centuries. 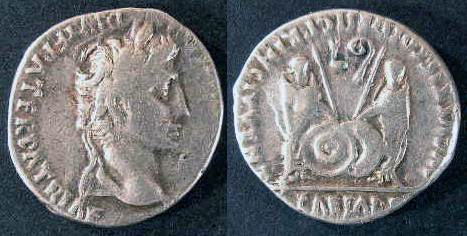 Our Lord was saying that rendering one of those coins with Cæsar’s image and inscription on it was not an evil thing for a God-fearing Jew to do. He was still free to worship God according to the Mosaic Law, and He was supporting a government that was governing more closely to God’s natural law than any government the Jews had seen in centuries. Saint Paul would enlarge on this idea in his Epistle to the Romans—you can have a look at chapter 13 when you go home. Essentially, he says that in keeping the peace, and doing justice, and doing the other things necessary to keep society working, that the secular authorities are doing work appointed by God. It is only reasonable and moral to respect and support them. Governments are legitimate insofar as respect and foster those unalienable rights—insofar as they are based on God’s moral law. Our Lord would not have acknowledged the lawfulness of tribute to Cæsar if his government had been terribly unjust. There could be no coin of tribute to a ruler who habitually usurped those unalienable rights; who encouraged lying, stealing, murder, or any of those essential evils prohibited by the natural law. Our Declaration goes a step further. It suggests that those with the unalienable rights are the ones who get to establish the government through their own consent. This was a radical departure from most of the history of human government, in which, at least initially, governments were formed by the one with the mightiest sword. It also suggests a grave obligation on the part of those governed. It is no longer enough to ask whether or not is lawful to pay the tribute. Since the Republic is constituted by those whom it governs, it is our constant duty to know what the Republic is doing, and why, and to whom. Are the unalienable rights of men and women, are the principles of the moral law being fostered, or are they being attacked? Every second November, we Americans get to replace our entire Congress, a third of our Senate, and a goodly number of local officials. Every fourth November, the President and Vice President. But this precious right to self government means that we have more than the obligation to pay tribute in those green paper notes with Presidents’ images on them. It is our duty to select those who will govern best. The system isn’t perfect—no human system ever will be—it is our duty to make it work as best as it can. As best as we can. That will require some effort on out part. It cannot be done by wandering into the voting booth in November and casting ballots at random, nor by voting for everyone running on the party for which our grand-parents voted. As in Jesus’ time, some will say that God-fearing people ought not be involved in the affairs of Cæsar and the world—others will demand obedience to the party line. But our Lord found a middle ground, as must we—rendering not simply our money, but our time, our study, our careful consideration, our well made decision on election day, and an occasional letter to those in charge. Legitimate government depends on its careful adherence to the laws of God—legitimate government depends on us. Summa theologica Prima Secundæ Partis, qq. 90-97. Ibid. q. 93, a. 2 & 3.